more difficult than " Morbid tales " , for me . One might quibble with Horus/Aggressor as one choice but Horus on its own would've easily fallen out first so it's a fair play as it stands . . . .
Mmmmm...much more difficult then the CF poll. At least i know my favorite one on this album. Going to listen one more time before i vote. This. Though the idea in the first seconds with the drums is great, but the song itself can't keep it like the other songs on the MLP (+ 2 sampler tx). Heh, H/A is going down fast. Yeah, seriously. I even went that way. This was hellishly difficult because of how lop-sided the inflluence of the other songs are and how much more I listen to them. 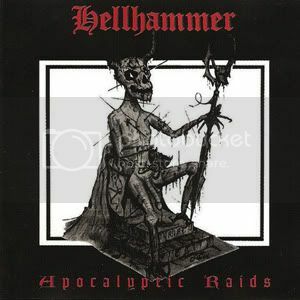 Hellhammer is a truly fascinating phenomenon that persists to this day, even in death. They never hit big, were so terribly maligned, didn't have a huge catalog, yet ask anyone today in extreme metal and see what happens. This is very difficult, but I had to go in this direction. "Messiah " played by Celtic Frost , dec. '85 great shot ! !